20.08.12 Bilbao. The City Halls of Bilbao and Sao Paulo have officially announced this morning the agreement between the two cities for the holding of the 5th Grand Slam Masters Final in September and October. Although negotiations have been taking place during the last few months, the agreement was finalized during the visit made to Bilbao by the Deputy Secretary for External Relations of the Prefecture (City Hall) of Sao Paulo, Guilherme Mattar. 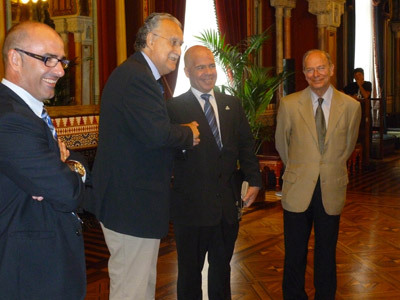 After working out the last sport and business details, the Brazilian politician met with representatives from the Bilbao Chamber of Commerce and the Bizkaia Provincial Council, as well as the Managing Director of the Bilbao City Hall, Andoni Aldekoa. “The agreement reached by our two cities to share the hosting of one of the world’s most important chess tournaments is, for Bilbao and Sao Paulo, a magnificent opportunity, not just for sport, but also economically and commercially and even socially, because of the aim we have proposed this year of promoting the practice of this precious sport in schools and among the youth, as an instrument of integration”, said the Deputy Secretary for External Relations of the Sao Paulo Prefecture (City Hall), Guilherme Mattar and the Executive Director of the Bilbao City Hall, Andoni Aldekoa. The tournament, in which six of the world’s top chess players will participate, will be played in a double round-robin league. The Brazilian megalopolis will host the first round from September 24 to 29 and the second and deciding round will take place at its fixed venue, Bilbao, from October 8 to 13. The identities of the participants in the 5th edition of the Masters Final will be announced at the official presentation ceremony which will be held in Sao Paulo. The 5th edition of the Grand Slam Masters Final will continue its global expansion begun two years ago with the joint hosting of the tournament between Bilbao and Shanghai. After the success of the last edition, the Biscayan tournament will once again be held in South America, specifically in the Brazilian city of Sao Paulo, Brazil’s main financial centre and the tenth most populated metropolis in the world. The tournament is aimed at transcending the boundaries of just sport and serve as the link between both cities to develop common projects in the fields of Sport, Culture, Recreation and Education, as well as Economics and Business. Specifically, a group of Biscayan businesspeople will travel to the Brazilian economic capital during the first round of the tournament to hold meetings with Sao Paulo businesspeople. In addition to the business mission, this year in Brazil the desire is to focus on transmitting the values of chess among the very young. Therefore, the championship will be approaching the city’s public schools.